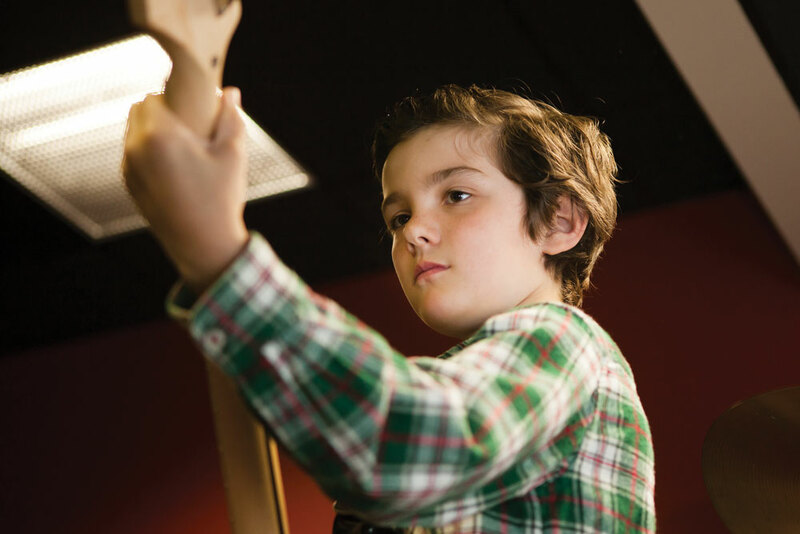 On a recent Saturday at School of Rock Annapolis (SOR), 11year-old Jackson Anderson warms up his picking hand on his red, aptly branded “Jackson” guitar. The assembled group, a mix of plaid shirts, checkered Vans® sneakers, and one 1980s-clad vocalist, begins a routine sound check. “How about ‘Smells Like Teen Spirit’?” asks Ben Grant, the band’s SOR mentor, as the rehearsal begins, referring to Nirvana’s epic original. Anderson starts in with the four recognizable opening chords, and is followed by 13-year-old drummer Jack Peery, who tears into the rapid-fire beats that help sustain the song’s unique sound. 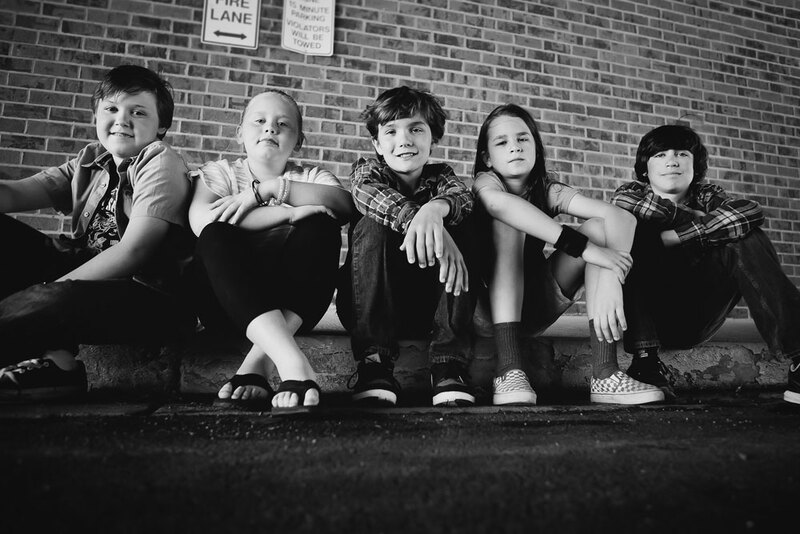 The other two band members—10-year-old bassist Jacob Spitzer and 13-year-old keyboardist Trystin Martin—join in while eight-year-old Katie Hall begins mimicking Kurt Cobain’s vocal nuances. A wild, swirling, thumping melody fills the studio for the next four minutes. The band is Fast as Lightning, and its playlist, which currently includes 12 songs, is ever growing. The band members jointly wrote their first original song, “Kat in the Hat,” after Anderson met actor and musician Jared Leto at a concert, and the celebrity suggested the Dr. Seuss-inspired title. The group performs at some of Annapolis’ most renowned live music venues, and has a mounting online following. Anderson, who is lead guitarist, daydreamed since kindergarten about starting a band, and even designed a preliminary logo that later morphed into their current brand. 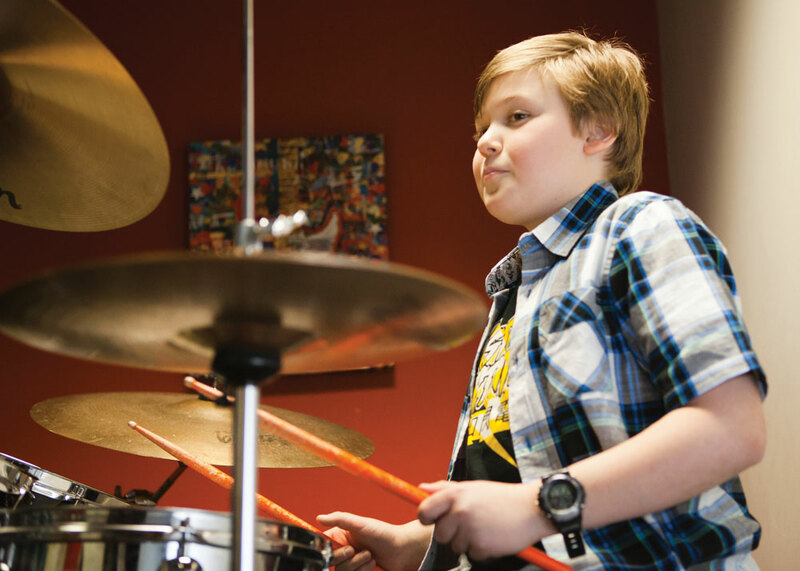 Last summer, in 2014, Anderson’s parents approached SOR about their son forming a band independent of the school’s performances, using SOR space for rehearsals. When the school agreed, the band began to coalesce, based on referrals by each new member. As might be expected, an interview with this band is filled with giggles and half-finished sentences, a blend of intended coolness and quirky outbursts. They tease, talk over each other, recall a recent disagreement, and end up embracing. They also debate everything—the definitions of certain music genres, the best local music venues for performing, whether they’ll be famous one day or go to college (or both). In the end, this much is certain: the members of Fast as Lightning are in it for the music, and share a deep love of learning, creating music together, and being in a band—not with just anyone, but with each other. How long has each of you been playing an instrument? Peery: I’ve been playing for two years. Katie Hall: I started guitar lessons in kindergarten. I really liked music when I was little. I first took guitar lessons at a music store. 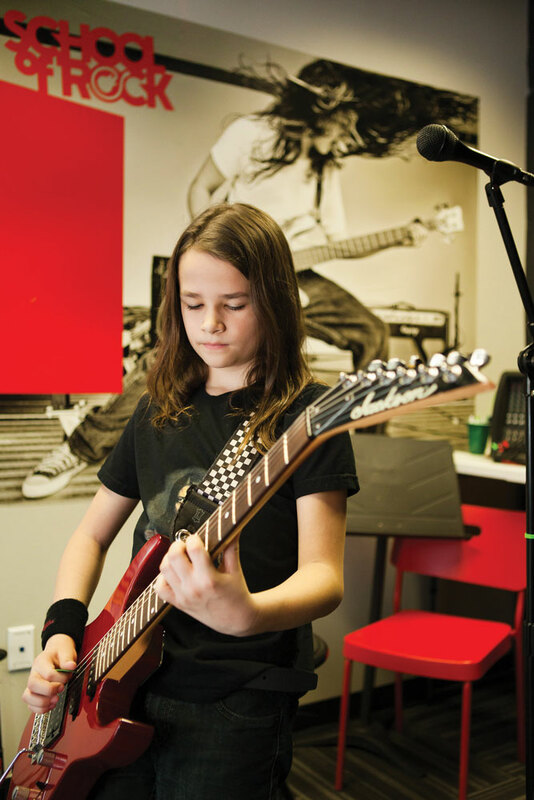 Jackson Anderson: When I was seven, I started playing a video game called Rock Band, and I could play all the songs on expert-level. [So] I was playing video games, which is basically why I started playing guitar, and my parents signed me up [for lessons]. And I ended up liking it a lot. Jacob Spitzer: I started when I was five, but my fingers weren’t big enough to play guitar. So then once [SOR] opened, I played guitar for two years. Until I found out I really liked to play the bass instead. I’ve been playing bass and guitar for about three years now. Trystin Martin: Two years. I don’t like playing sports, so my dad said I had to either play a sport or play an instrument, and I started liking piano. Are you all best friends? Anderson: Pretty much. We’re all friends now. What is your favorite part about being in a band together? Anderson: It’s fun and you make money. Spitzer: I like the process of making your own songs and playing the songs we want to play. Peery: I like all of it—the experience and the fun times I have doing music. It’s all about the music. How do you decide which songs you’ll learn to play? Spitzer: Every two months, we pick two songs each, and we come in and play all the songs. We have to decide between one song each person has picked. And then those five songs are gonna be the songs that we learn to play. Do you ever get butterflies when you perform? Anderson: Agreeing—agreeing on what to do and how to do it, in terms of what songs to play and how to play them. Agreeing on what type of band we want to be. A little bird told me you might have had a fight recently. So you don’t agree on everything, but somehow you got past it? Peery: We’re kind of like an alternative rock band. Spitzer: No, we’re an anything band. We have Nirvana, we have grunge. We don’t really do “now” kind of music. We do older music, like ’80s and ’90s music. We have “Just a Girl” from No Doubt, which is kind of pop[-like]. We have “All the Small Things” from Blink-182. We have Weezer’s “Buddy Holly.” We have “Separate Ways (Worlds Apart)” by Journey, “Barracuda” by Heart. Do you guys have favorite musicians and influences? Anderson: I like Morgan Freeman [laughter]. Oh, musicians? I like Jared Leto. He’s not only a musician, he’s an actor, too. Martin: I like Queen and Pink Floyd. Peery: I haven’t had any real inspiration. I just wanted to play the drums. Weezer is my favorite band. Hall: I like Gwen Stefani from No Doubt, because she has a lot of character. I think we all have a lot of character! Spitzer: I like Red Hot Chili Peppers. I like Weezer. I like Jack Johnson. I like Jack White in the White Stripes. I also like Michael Jackson. Where do you see yourselves when you’re 25? Anderson: We would come back to America. Hall: We’d probably still be on tour and stuff. But if that doesn’t work out, I’d probably be a music teacher. Anderson: I’ll probably be spending all my money at McDonald’s. Martin: Sounds like a good idea. Spitzer: Maybe one year we can, like, travel a little bit farther than the Annapolis and Baltimore area? Hall: We should buy this huge RV and write “Fast as Lightning” on it! Anderson: We could play at Jiffy Lube [Live] or Merriweather [Post Pavillion]. Do you guys want to play one more song so we can get a few more pictures? Error: Error validating access token: Session has expired on Saturday, 09-Mar-19 15:57:50 PST. The current time is Tuesday, 23-Apr-19 08:50:54 PDT.